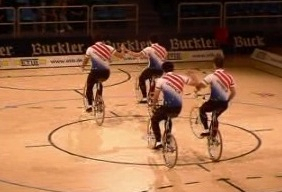 i guess those four guys  would really rule all trackstand competitions although they chose the uber-cheesiest medley for their presentation. i linked to the coral cache version of the 37 mb .mpg-movie to ease the burden on the hk-icycling-server a bit. if it doesn’t work, try this direct link.